If you love coffee and you love cats, then Elena Efremova should be your new favorite painter. Efremova, a Russian illustrator currently living in Marseille, France, has created a collection of cat paintings using coffee as a medium. Her goal was to match different coffee drinks to cats of similar character. 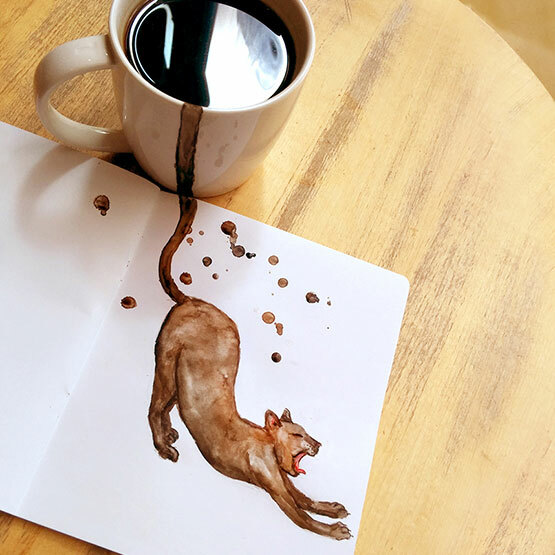 From her morning cup of Americano, she paints a cat yawning and stretching. From her affogato she paints hugging dark- and light-furred kitties. These totally charming illustrations, straight out of French cafés, are not to be missed. Efremova writes, "Here are my coffee cats :) Each has its own character, as well as every type of coffee has its own flavour." Sure enough, the "sweet cappuccino cat" looks out at you from the page, begging you to pet it, while the dark macchiato cat has white paws and a bitter disposition. For the full café experience, you can also check out Efremova's dessert paintings. Sweets and Watercolor is a collection of watercolor illustrations of some of the most charming pastries you'll ever see. Cakes on doilies that are too precious to believe, éclairs you'll want to eat straight off the page, and so much more. For all of Efremova's totally gorgeous illustrations, check her out on Behance.